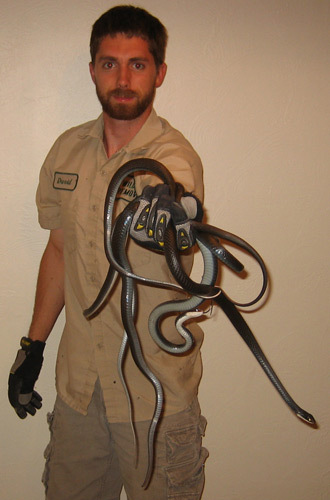 Physical Snake Removal Involves the direct removal of any unwanted snakes from a particular area. This can be accomplished with snake hooks, snake tongs, or by grabbing snakes by hand. Captured snakes are usually transported in a snake bag. Snake Prevention Involves eliminating the things that attract snakes - this includes unnecessary debris, wood piles, clutter, and too much vegetation. It also involves eliminating very attractive snake areas like gaps under concrete or decks. Snake Repellents Would be nice, but are not effective. There's lots of various repellents for sale on the internet, but in my opinion and years of testing, I've found them to be bogus. Snake Trapping Means setting a trap in an area with snakes. The trap captures the snake, which can then be removed from the area. Snake Exclusion Involves sealing shut any areas that snakes can use to enter a space. This means sealing holes leading into your home, installing weather stripping on the bottoms of doors with open gaps, sealing off holes in the screen leading to your pool area, etc. Snake Education Is often the best tool. If you know what types of snakes you are dealing with and how they behave, you'll have a better idea of how to control them - or even that it might be a better idea to just leave them be! If you want to buy snake traps in order to control your snake problem, click the below button. Snake control products - The type of snake control product you use depends on what you think will deter snakes. There are numerous commercial products on the market; shakers, sprays, and so on. There are just as many home remedies available. You have probably already stumbled on information about using a rope to keep a snake away or using mothballs around your property. When it comes to repelling snakes, the two repellents that have any proven success are mongoose urine and kingsnake musk. Don’t try to find these items because they are sold only to professional snake removal companies. Instead of buying a chemical product to get rid of snakes, consider doing some basic remodeling of your property. Snakes are on your land because it provides them with something enjoyable. The most common culprit is long grass. Many homeowners like to keep their grass longer in the summer, especially during a drought. This is not a good practice if you want to avoid snakes. Snakes love long grass. It is cool on their bodies and provides cover for hunting and protection from predators. It will allow them to move to other areas of the yard without issue. If you have sheds, walls, decorative rocks, or patio stones, you will probably see a snake investigating them. Eliminating items like these from your yard will help keep snakes away. If you control mice you will control snake - It is partially true that if you can control the mice around your home you will control your snake population. Snakes will definitely be drawn to homes where there is an abundance of food. 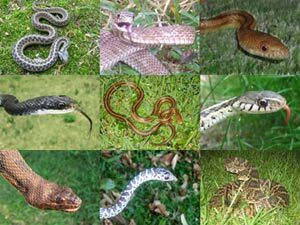 Rodents are a primary source of prey for many snake species, and having too many rodents is often characteristic of having too many snakes. Snakes will help you against the rats and mice; however, they will not be able to keep the population at bay. Rats and mice reproduce far too quickly for a snake to keep up. The best defense against both nuisance animals is to fix up your home and the area surrounding it. All pest creatures like to have thick vegetation and rubble to hide in. If you eliminate the tall grass and dilapidated buildings, you eliminate the areas for these critters to hide. Better still, by keeping up with your home’s exterior, you ensure that no rodents or snakes can enter through a foundation crack or damaged area of the building. Pest animals are far worse inside the home than outside. Keeping up with your property is worth more than all of the chemical repellents and traps on the market combined. For information about How to Get Rid of Snakes, click this link.